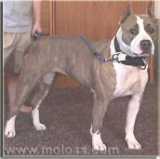 History of the Pit Bull part 1. 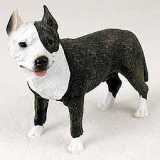 No other breed of dog has experienced as many discrimination's and misconceptions as has the Pit Bull. While some people would tell you that pit bulls are a gentle and harmless pet, other people consider them as wicked and evil enough to be Satan’s guard dog. 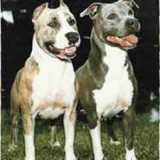 Although neither viewpoint is accurate, both have some basis in fact and in the Pit Bull controversial origin. Humans and the history of the Pit Bull have long shared a bond that was based on function. Early dogs that were the least valuable and useful did not make it into today’s time. On the other hand, the most valuable and helpful of dogs remained and created others like them. 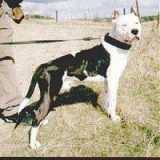 That is the History Of The Pit Bulls. Ultimately, breeding the best hunters to the best hunters and the best guards to the best guards produced breed predecessors. Those that proved to be the toughest and the bravest, which are traits that were most valued during the early times, became more and more specialized. By the Greek era, large and powerful dogs, which were called Molossians, were very popular and valued as a high price piece. Phoenician traders regarded them as an expensive commodity and used them as a bartering item. By means of bartering, the Molossians were distributed along the Phoenician shipping course, which included stopovers in ancient Britain. The Molossians who remained in Britain became further specialized and brought about the beginning of the mastiff line of dogs. The Mastiffs were polished as war dogs in Britain. When the Romans invaded Britain, they were impressed by the Mastiffs’ stance and strength that they brought some back to their country. The Mastiffs then became known as fighters or “dog gladiators” who went against humans, lions, bears, and even against each other. Like Rome, the British also reveled in this vicious sport. They also placed high worth on contests that showed animals fighting to death. The display of a powerful dog fighting and ultimately killing a bull was the biggest entertainment that the villages could provide its citizens. This form of entertainment extended over all classes and by the sixteenth century bull baiting and bear baiting became the finale for a royal night of entertainment. The dogs’ owners gained popularity for their animal’s impressive act, and the offspring of these dog gladiators were desired and sought after for their capability of delivering high prices. And because of their power, strength, and ability to bring wealth to their owners, more and more of these dogs were produced over the course of time. 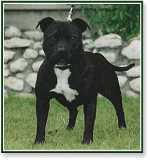 This is where the history of the Pit Bull claims his heritage. A New Pit Bull Needs To Be Comfortable Too! A Fighter In The House? 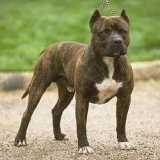 - Many Pit Bulls Are!